Cards like this make me wonder what could have been, had Choose Your Own Standard become more popular. Engineered Explosives seems like it was designed for use with the Invasion block’s domain cards and Elder Dragons, not to mention sets like Ravnica and Shards of Alara where you often have an “incidental” extra color of mana. That, fortunately, is what casual Magic is for! That’s not to say that it’s any kind of a letdown in competitive Magic – quite the opposite, actually. Extended formats with fetchlands and shocklands together turned Ravnica‘s multicolor world up to eleven, and this of course carried over into Modern. Its low printed mana cost interacts positively with Trinket Mage, and its card type interacts with Academy Ruins. Its use of charge counters interacts positively with the proliferate mechanic. And because of the way sunburst is worded, it can charge up enough to destroy Nicol Bolas if you’re playing in silver-bordered world ! After the disastrous Darksteel, Fifth Dawn tried to power things down by incorporating a mechanic that cares about colors of mana used in casting a card. 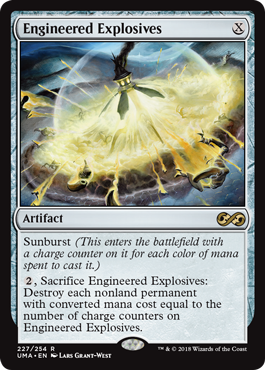 Most of the sunburst spells were a flop; Engineered Explosives was the exception to this, becoming a multiformat staple. Engineered Explosives is similar in execution to Ratchet Bomb and Powder Keg: blow up all of the things. What makes Engineered Explosives “better” is that it’s faster to tool the artifact to blow up what you need. The “X” in the casting cost lets you sink mana into it, but it only cares about what colors get used, so you get your choice of blowing up anything from 0 mana all the way to 5 mana. It’s even as efficient as Powder Keg and Ratchet Bomb in nuking tokens, so it comes out ahead there. As far as the artifact nukes go, Engineered Explosives is arguably the best one of the bunch, since its flexibility and speed make it a valuable part in any deck. It counters a lot of strategies efficiently, and it’s apt to remain a staple of many formats for the foreseeable future, particularly with mana curves as low as they are.